Was Albert Einstein autistic? There is no way to tell beyond reasonable doubt because it is not suitable to make a diagnosis after death. However, there is considerable speculation on the notion of Einstein and autism. Autism disorder characteristics include many admirable traits, including sharp intellect as well as the ability to focus on a certain topic with great intensity. Such intense concentration can give rise to some problems with interpersonal relationships and the ability to interpret social cues. Such intense focus and intelligence can make eyebrows rise, questioning "Was Albert Einstein autistic?" According to New Scientist and BBC News, he may have had Asperger's or high functioning autism. However, it is impossible to tell from the modern perspective but there are some traits to consider. The article Einstein and Newton Showed Signs of Autism notes some signs of autism that are apparent in Einstein's case. Perhaps the most compelling autism symptoms are from Einstein's early years. He was a late talker, reportedly speaking his first words when he was between two and four years old. When he did develop language, he often repeated certain sentences with seeming obsession, similar to perseveration and echolalia among individuals with autism. In spite of the glaring delay in speech, there seems to be no indication in current speculation about communication, which is quite different. Einstein may have used spoken words later than average children may, but he may have used other effective means of communication in its place. A considerable symptom of autism an Asperger's syndrome is difficulty with social reciprocation and conversation. Albert Einstein was considered a loner and he noted that he did not require direct contact with other people. However, he was known for his great sense of humor, which is unusual in cases of autism. Among the most common traits of autism is self-stimulatory behaviors (stims) and there seems to be little evidence that Einstein engaged in stereotyped repetitive movements commonly associated with the disorders. Neurotypical people engage in stims as well when they watch television, chew fingernails, or tap their pens. The basic difference is people on the autism spectrum engage in behaviors that are not in the "normal" realm. Some reports suggest that Albert Einstein had tantrums when he was a child. Abraham Pais and Roger Penrose note that his tantrums ceased when he was about seven years old in the book, Subtle is the Lord: The Science and the Life of Albert Einstein. Self-awareness is a considerable issue on the autism spectrum. Many individuals on the spectrum have difficulty processing sensory input, which may lead to trouble with body awareness including proper posturing and distinguishing the self from others. In the book, Dear Professor Einstein, a grieving father suffering the loss of his eleven-year-old son to polio asked Einstein how he could believe that the child no longer existed after death. Einstein replied that the human experience as individuals is a delusion. The notion that Einstein perceived the human condition in such a way is quite similar to the theory of mind, that many individuals with autism experience. Many people on the spectrum have difficulty understanding that other people have emotions and thoughts that differ from their own. There appears to be genetic components to the predisposition for an individual to have autism. Parents have a 1 in 150 chance of having a baby with autism; parents of autistic children have a 1 in 75 chance of having another child on the spectrum. 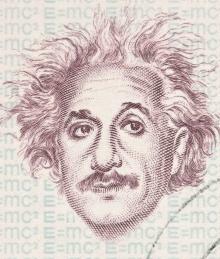 Albert Einstein's genetics may play a role in some of the speculation. The article, Autism Genes Can add up to Genius discusses links to musical, artistic, and mathematical splinter skills, mentioning Einstein as an example of such creativity and genius. Some note that Einstein had relatives diagnosed with autism and dyslexia but none of them names any specific relatives. Another consideration is the Einstein Syndrome, in which very intelligent children begin speaking late. Parents are often concerned about developmental delays among this population but the children do not meet the criteria for a diagnosis of autism or related pervasive developmental disorder.